Everyone wants a set of pearly whites. However, due to various factors, the teeth can become yellow or stained. The enamel becomes thinner and more transparent with age, and the dentin (inner layer of the tooth) appears darker. That, along with having absorbed certain types of staining liquids throughout your life, your teeth can look discolored. At-home teeth whitening offers you the opportunity to brighten your teeth and enhance your smile. What Are The Advantages of At-Home Teeth Whitening? The three main advantages of at-home whitening is the cost (affordable for nearly every type of budget), convenience (treatment can be done on your own time and schedule), and variety (several whitening options). Dr. Naik, an experienced Moreno Valley dentist, often meets with patients who are unhappy with the color of their teeth and are ready for improvement. If you are tired of having to cover your teeth when speaking or find yourself avoiding smiling and laughing due to the embarrassment that discolored teeth can cause, whitening may be a great choice for you to consider. What At-Home Whitening Treatment Are Available? It is important to meet with Dr. Naik prior to buying an over-the-counter tooth whitening and beginning the bleaching process. He will make recommendations regarding which product will provide you with the best results and meet your cosmetic dental goals. The most common at-home treatments include: dentist-dispensed whitening trays, whitening strips, paint-on whiteners, whitening mouthwash, toothpaste with peroxide and/or abrasives, and whitening floss. Depending on what Dr. Naik recommends, you may be able to use more than one whitening product. How Long Do At-Home Teeth Whitening Results Last? In order to maintain beautiful results, you must be very conscious of the type of liquids and foods you take in as well as the type of whitening product you are using. Heavy intake of coffee, tea, soda, and/or tobacco can discolor your teeth once again. Therefore, in order to keep your teeth sparkling, you must understand that over-consumption of these staining agents will cancel out the original results. So continue to practice good oral hygiene. Brushing twice a day, flossing daily, and visiting the dentist per the recommended amount of time each year will especially help to prevent discoloration from returning. Be sure to also follow instructions for the whitening product you choose – consistency is key to ensuring that the outcome will be long-lasting. 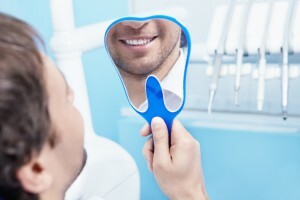 At-home teeth whitening products are deemed as safe. However, some people are prone to sensitivity more than others. Should you experience unusual tooth sensitivity, it is best to visit Dr. Naik. Another whitening option may be worth considering. What Type of Foods and Beverages Should be Avoided In Order to Maintain Results? The frequent causes of tooth discoloration and yellowing are coffee, tea, cola, and red wine. Tobacco use can also negatively affect the quality. In order to maintain whitening results, limit your intake of these items. It will save you money and time in the long run, while keeping your newly enhanced smile intact.